The following post was written in partnership with PATH‘s Better Immunization Data (BID) Initiative. Patients at Usa River Health Center Tanzania. Photo courtesy of the BID Initiative. In this spirit, the International Training and Education Center for Health (I-TECH) joined forces with PATH’s BID Initiative to prevent disease by developing a platform to better trace vaccinations in low-resource settings. As part of its Global Health Security award, I-TECH is localizing the BID Initiative’s Zambia Electronic Immunisation Registry (ZEIR), an app powered by OpenSRP which is an open source mobile health platform, for use in Siaya County, Kenya. I-TECH reached out to the BID Initiative last summer to hear more about BID’s lessons learned. The two teams began collaborating in earnest last December, leveraging the BID Initiative’s large scope in Zambia and Tanzania with I-TECH’s expertise in working with the OpenMRS platform. Reuben Mwanza (right) of PATH enters vaccination data into a tablet computer during a vaccination service at the Mahatma Gandhi Clinic in Livingstone, Zambia on October 17, 2016. Photo courtesy of the BID Initiative. In Kenya, I-TECH has been tasked with building an electronic platform to capture immunizations when they happen. 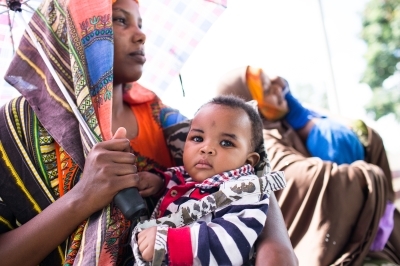 The aim of the project—conducted in partnership with the Kenyan Ministry of Health, the CDC Global Health Protection Division, and the CDC Global Immunization Division—is to improve immunization coverage. This is done by tracking and monitoring who is due for which vaccine, starting with population-level coverage within a single county, thus decreasing the chance of outbreaks of vaccine-preventable diseases. 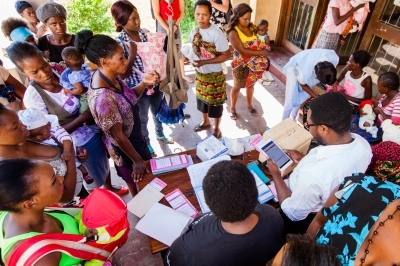 Similarly, the BID Initiative has been working with the Ministry of Health and nurses in Tanzania and Zambia to develop an electronic immunization registry, among other data use tools, to ensure data becomes more accessible and useful to health workers. This, in turn, can help with decision making to prevent vaccine stockouts and enable follow-up with patients who have not returned for needed vaccines. BID’s learnings provided an opportune starting point for I-TECH’s work. I-TECH and BID have turned to Ona, a social enterprise based in Nairobi, Kenya, committed to fostering change by building information systems infrastructure. BID began working with Ona in January 2017 to adapt the OpenSRP system to Zambia’s national immunization program. This open source development process has been critical to the success of both teams and represents the collective knowledge of a community of developers known as the THRIVE Consortium. Matt Berg, CEO of Ona, views the OpenSRP app created for both projects as a customizable springboard that could potentially accommodate additional modules for antenatal care, malaria data, and maternal and child health. “From our prior work with BID, we had this great starting point that another country or group could take and adapt and get up and running quickly,” says Berg. Cost is a major driver for any implementation. Until now, it has been more cost efficient to build specific functionality on top of popular generalized information systems and tools, which decreases adaptability. Initial investments in the BID and I-TECH projects have allowed for both flexibility and specificity. This collaborative environment and focus on adaptable design increases cost efficiency and allows the BID Initiative to fulfill the intention for its solutions to be used in multiple contexts. This blog post was supported by the Cooperative Agreement Number, U2GH001721, funded by the U.S. Centers for Disease Control and Prevention. Its contents are solely the responsibility of the authors and do not necessarily represent the official views of the Centers for Disease Control and Prevention or the Department of Health and Human Services.